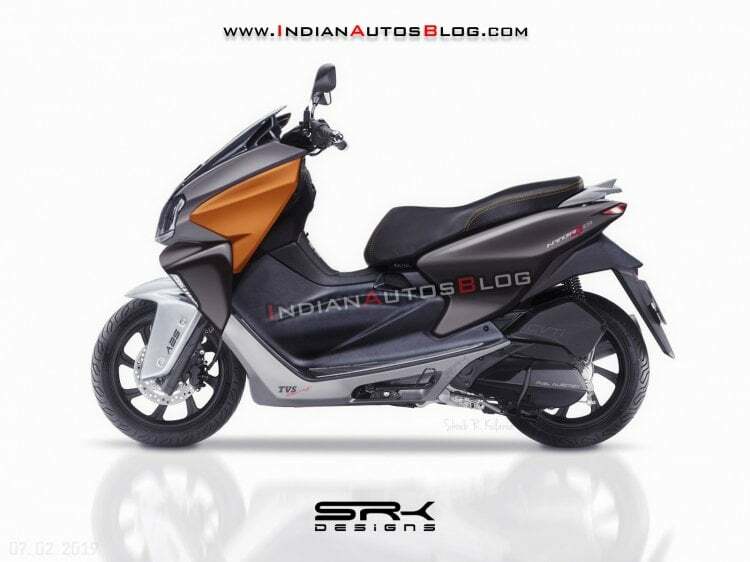 Check out this sporty rendering of TVS Ntorq 150 scooter! Last year, we reported that TVS is developing a new 150cc maxi-scooter for India. Chances are that it could be named as NTorq 150, inspired by the Entorq 210 concept. TVS Ntorq 150 was rumoured to launch in 2018 and is still speculated widely. In a report from 2018, it was confirmed that the brand is working towards a new 150cc maxi-scooter. At the 2016 Auto Expo, TVS showcased the Entorq 210 concept. It was presented as a Maxi-scooter equipped with the latest features onboard. Premium features included a smartphone docking station and remote keyless entry. IAB has prepared a sporty rendering of the TVS Ntorq 150, which is inspired by the Entorq 210 Concept. The rendered scooter also takes some design and styling cues from the Ntotq 125. Being a maxi-scooter, TVS Ntorq 150 gets the elongated footboard with a forward-foot position. It gets an upright stance and relaxed ergonomics. With a 150cc engine, it can also be known as a comfortable long tourer. At the front, it gets a Ntorq 125 inspired design with a similar type of apron and reworkd headlamp system. The traits of the perfect Maxi-scooter can be seen over the unusually mounted handlebar. At the side, it gets the TVS Racing decal, like the Ntorq 125. The side body has been sculpted to create a premium effect. The rear portion seems to be literally borrowed Ntorq 125. As said earlier, TVS Ntorq 150 will be equipped with features such as the fully-digital instrument cluster, Bluetooth integration, Turn-by-turn navigation and most likely, LED headlamps. Since it is a 150cc scooter, it will get a single-channel ABS as standard. The engine specifications stand unknown, but we can expect a 150cc liquid-cooled fuel-injected engine onboard. The power figures could range between 12-14 BHP and torque between 14-16 Nm. Since it will be the flagship product from TVS, expect it to be priced an upwards of Rs 80,000. The other two 150cc scooters – Aprilia SR 150 and Vespa 150 are priced above Rs 90,000. Even Yamaha India is expected to launch a new 150cc scooter by the name, NMax in India. NMax has already been spotted in India earlier on the occassion of a global event.